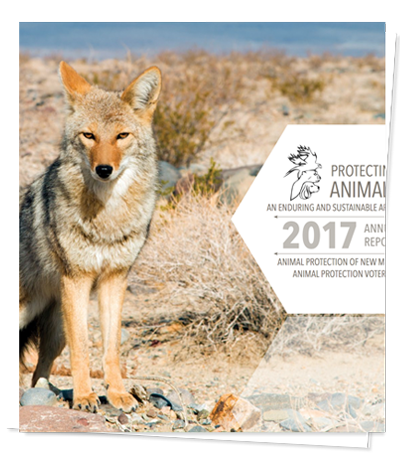 Since 1979, Animal Protection of New Mexico has worked for the humane treatment of all animals by creating lasting, fundamental change. Your tax-deductible donation will help make humane the new normal in New Mexico and beyond. As a charitable non-profit organization, Animal Protection of New Mexico relies on support from caring people like you. Donate all or a portion of your State Tax Refund. You can donate to the Horse Shelter Rescue Fund (line 13 of the New Mexico PIT-D form) to support shelters that give second chances to hundreds of homeless horses, donkeys, and mules and/or donate to the Animal Care and Facility Fund’s statewide Dog and Cat Spay/Neuter Program (line 14 of the New Mexico PIT-D form) to help prevent the needless suffering and death of dogs and cats due to overpopulation. Click here to access the New Mexico PIT-D form. Join the Compassion Circle: Monthly giving is an easy, tax-deductible way to make a difference for animals all year long. Donate securely by debit or credit card here. If you’d prefer to give monthly by check, our Donor Relations Manager can show you how. Make an Honor or Memorial Gift: Honor a person or an animal by making a donation in their name. Donations of $25 or more include a beautiful announcement card for the recipient. When making a one-time donation choose from the “in memory of” collection to remember a departed loved one, or “in honor of” to celebrate someone on their birthday, wedding, or any special occasion. Give Through Work: Many companies offer matching gift programs. Ask your HR manager how you can double your charitable dollars through workplace giving. For tips on setting up a giving program at your company, reach out to our Donor Relations Manager. Give Through The United Way: You can designate Animal Protection of New Mexico a recipient of your United Way contributions. Simply write APNM’s name on your United Way form and submit it to your employer. Donate your Vehicle: Donate your old car, truck, or boat to help animals and gain a valuable tax deduction. Simply fill out this easy form and we’ll call you back to arrange free tow service. Give Through Your IRA: If you’re over age 70½, you can donate up to 100% of your annual required minimum distribution, up to $100,000, to APNM—tax free to both. Simply have your IRA administrator transfer the funds directly to APNM by December 31st. Also, when you bequeath your IRA to charity, rather than to your family, you protect your heirs from inheriting a significant tax burden. While non-profit organizations, like APNM, can inherit IRAs tax free, individual heirs must pay tax on the asset upon inheritance and on subsequent annual distributions. To learn more, contact our Donor Relations Manager. Donate Appreciated Stock: Gifts of appreciated stock benefit both you and APNM. Donated prior to December 31st, this type of contribution gives you a tax deduction for the full value of your gift and helps you avoid capital gains tax on the appreciated portion. 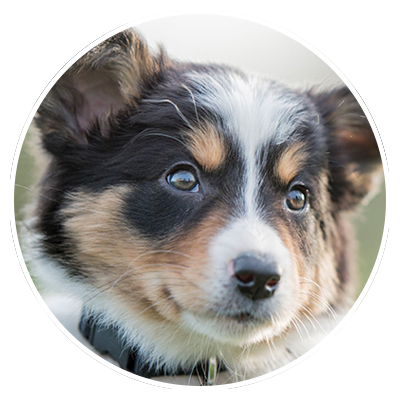 Make a Planned Gift: Animal Protection of New Mexico has created the APNM Enchantment Club—its planned giving club—for those members and others who have expressed an interest in planned giving to benefit APNM and the animals we work so hard to protect. Our Enchantment Club donors are generous individuals who wish to name APNM as a beneficiary in their will or make another type of planned gift, or delayed contribution. The chart below explains different types of planned gift instruments. A popular one is the Charitable Remainder Trust (CRT). CRTs benefit both you and the charity. You receive income from the trust for a set period of time, after which the trust’s “remainder” is donated to APNM. You can realize significant tax benefits from this type of deferred gift. To ensure this gift’s integrity, work with your own financial adviser and attorney to establish a CRT. Please contact our Donor Relations Manager for more information. Periodically, Enchantment Club donors will receive the Enchantment Club newsletter. It contains useful information for donors such as: highlights of the hard-hitting work we are doing for animals; ways that donors can make an enormous difference by making a bequest to APNM; and a member spotlight about someone who has already included APNM in his/her will. 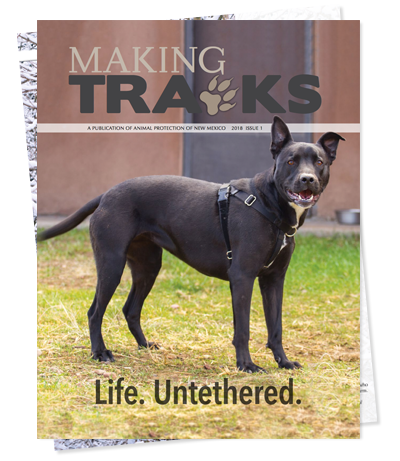 This newsletter will serve as a valuable resource for those who realize that making real change for animals requires not just strategic approaches but also adequate resources. Name APNM in Your Will: Leaving a charitable bequest to APNM is a simple and painless way to make a substantial gift. While not required, APNM would appreciate receiving confirmation that the organization is named as a beneficiary of your estate and a copy of the portion of your will or trust that names APNM. Contact our Donor Relations Manager for more information. Contribute to the APNM Endowment: Leave a legacy of compassion with a gift to the APNM Foundation. Endowment funds secure an organization’s future. Undisturbed capital is invested and the interest from the investment finances operating expenses. Help guarantee APNM’s tomorrow by making an endowment gift today. Imagine if every time you buy something (with your credit or debit card), a few cents went towards helping animals. It may not sound like much, but that change adds up. It helps us work on legislation that protects animals, helps us endorse and promote candidates who really care about animals, and helps us work to make New Mexico a better, more humane place for all animals. APNM has partnered with CaringCent.com, a donation platform that rounds up purchases to the nearest dollar, to offer you a new and easy way to make your small change matter for animals. It’s easy to sign up with CaringCent.com and designate Animal Protection of New Mexico as your charity. Your purchases will then be rounded up to the nearest whole dollar, and that spare change will go to APNM. It’s easy—there’s nothing for you to do at the store. Your purchase will automatically be rounded up at your credit card’s financial institution. You can cap your minimum monthly donation at as little as $5 per month. You can monitor and track all the giving you’re doing through your account on CaringCent.com. All it takes from you is a little change, but it can add up to big, positive changes for animals. To learn more about how this works, check out this 2-minute video or click here. To roundup and donate your change to help make a more humane community for all, please click the button below to get started. All non-profit organizations must have a 501(c)(3) designation letter from the Internal Revenue Service (IRS) attesting to the fact that they are tax exempt. APNM received its non-profit designation in February 1981. A copy of the IRS letter affirming APNM’s tax-exempt status is provided to donors upon request. Non-profits must file annual tax returns, called 990s, with both federal and state government agencies. Once filed, the New Mexico Attorney General’s office issues the charity a letter attesting that it is in good standing as far as filing the tax documents and financial reports required by the New Mexico Charitable Organizations and Solicitations Act. APNM annually receives such a letter from the Attorney General’s office. Non-profit organizations must be incorporated, have articles of incorporation and bylaws on file with the New Mexico Public Regulation Commission (formerly, the State Corporation Commission), and periodically file various reports with this agency. You can call the Corporation Bureau (505-827-4508) or visit the Regulation Commission’s website to check on the charity’s standing. For a modest fee, you can also obtain copies of the incorporating documents and amendments, etc. from the Commission. Online, charities throughout the nation are listed at guidestar.org, billed as the “Donors Guide to the Charitable Universe.” To check APNM’s status (or any other charity’s), go to the site map and enter the name of the organization you are interested in. Click on the organization’s record. Its assets and income will be displayed. You can view its tax return by selecting “more financial information.” The New Mexico Attorney General’s office is linking its own website with the Guidestar site so prospective donors can access this kind of information at all times. Consistent compliance with these regulations is one more reason APNM donors can give with confidence.